Stuffing is just about the best invented recipe, ever! It’s so good and so filling. I’m always a bit surprised that someone could come up with stuffing in the first place, though, as it seems like such a strange concoction. I won’t complain, though, because despite how unappealing stuffing tends to look, it’s so good you can’t keep me from going back for seconds. I was inspired by this stuffing recipe pin to try and switch it up this year! 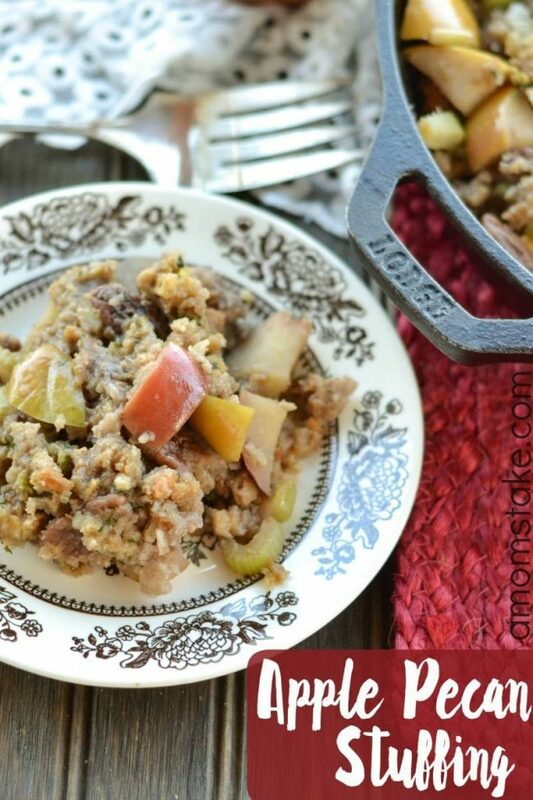 What resulted was a delicious apple pecan stuffing recipe that adds a kick of sweet to a traditional stuffing and makes it feel like a gourmet stuffing recipe, in less than 15 minutes! Melt butter in a large skillet. 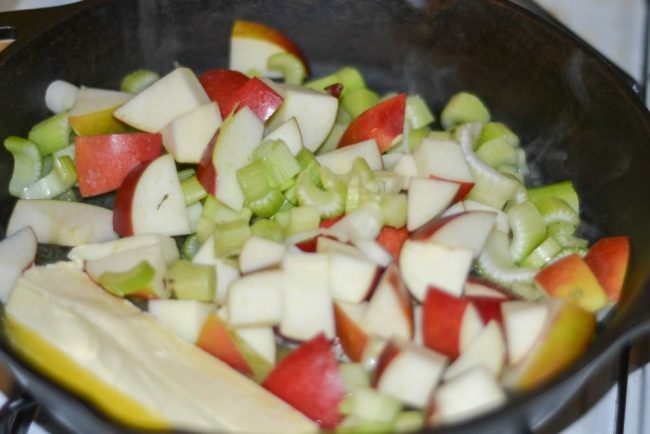 Add chopped apples and celery. Saute until celery and apples are tender, about 5 minutes. Add in pecans and let cook for another 1-2 minutes. Pour in your chicken broth and let come to a boil. Remove from heat and stir in Stuffing cubes. Serve. 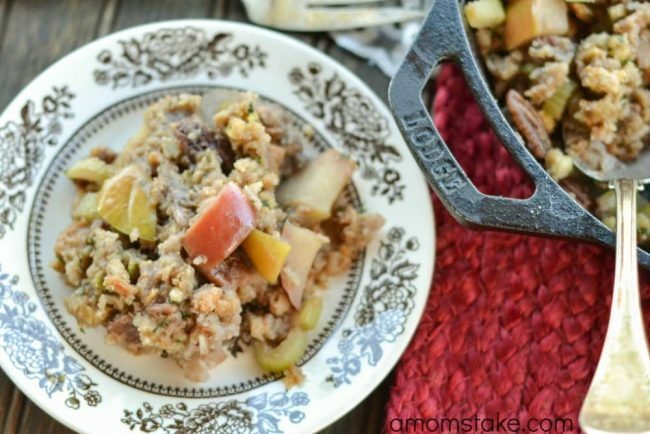 This Apple Pecan Stuffing recipe is going to make a perfect compliment to your Thanksgiving dinner this year, or as a side dish for any chicken dinner throughout the year. My wife loves stuffing like this, but I’m more traditional. Just turkey, bread crumbs, etc. (no fruit) in it for me! You had me at pecan 🙂 Although, I do love how the house smells when cooking apples! 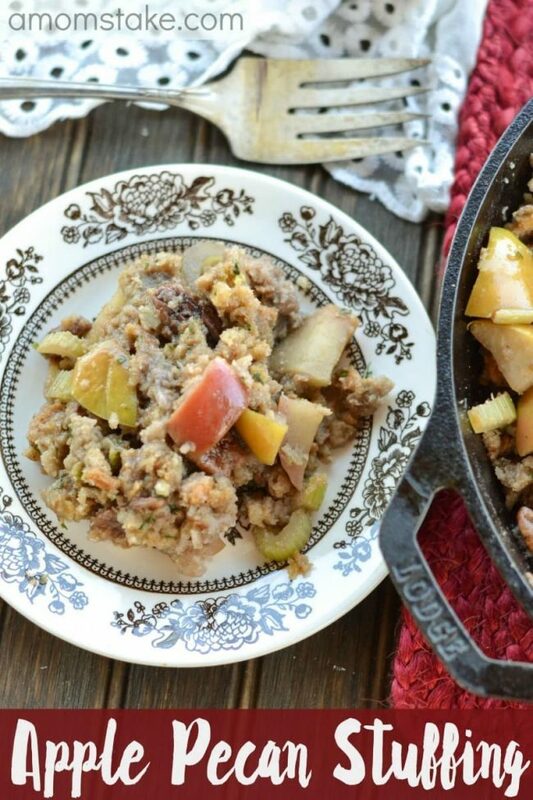 This apple pecan stuffing recipe looks delicious! I do love stuffing, but I like mine best when cooked in the bird. I’ve never tried stuffing with fruit in it before. This looks great! I’m not a huge fan of fruit in my stuffing but it does sound yummy! 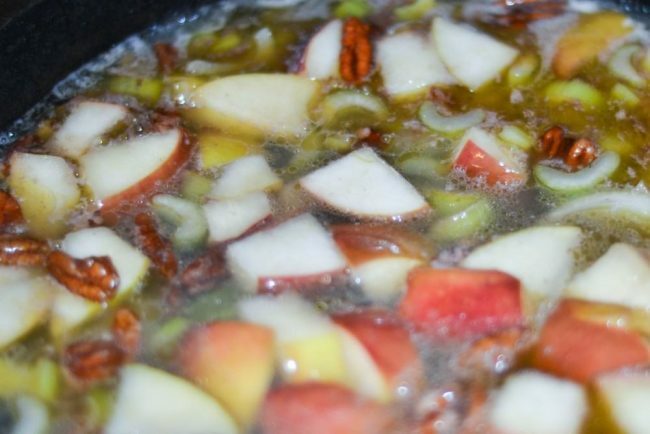 I’ve never made apple stuffing before but it would be a seasonal recipe to try! Love the pecans in it. Stuffing is always a favorite in our house and this recipe sounds like a winner! Thank you for sharing with us at Merry Monday. Your recipe will be my featured pick for Sunday’s party!. Yum! That looks amazing! I will definitely have to make this for my hubby! He loves any kind of stuffing! That is so right on so many levels. I know exactly what I’m stuffing into my bird this Thanksgiving. This sounds so delicious! I will have to try it for Thanksgiving this year.